Ever since she lost the 2016 election, Hillary Clinton has kind of stopped giving any effs, and we support that 100%. 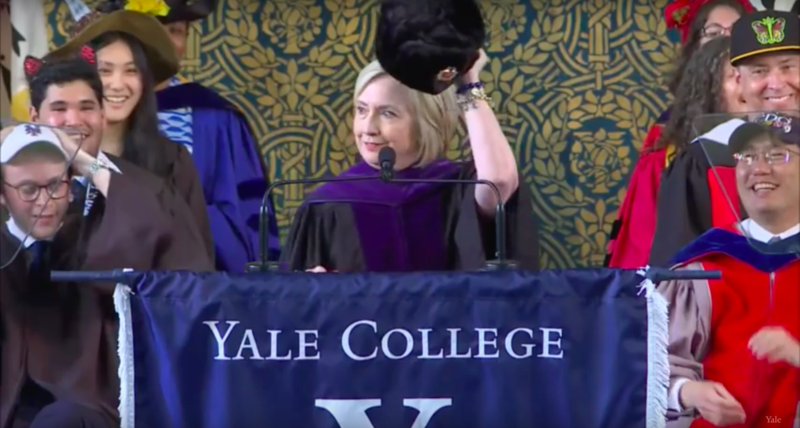 Clinton was invited to speak at Yale College’s graduation ceremony — also known as “Class Day” — and she took the opportunity to subtly troll President Trump. Typically, during Class Day, everyone wears silly or over-the-top hats. It’s a thing. Clinton wore a hat too: an ushanka, aka a Russian hat. In case you’ve missed the last two years, her Russia hat references the fact that Russia allegedly compromised the 2016 election. "I see looking out at you that you are following the tradition of over-the-top hats. So I brought a hat too: A Russian hat. Look, I mean — if you can't beat them, join them," Clinton told the crowd. Other than a cheeky nod with the Russia hat, she never mentioned Trump by name, but she did speak about the night of November 8th, 2016. "No, I'm not over it. I still think about the 2016 election. I still regret the mistakes I made," she recalled. "Today, as a person, I'm okay, but as an American, I'm concerned." Even though she was invited to her alma mater to inspire the class of 2018 with words of wisdom about following your dreams and building a career, her speech was very of-the-moment and didn’t ignore the current political climate. She ended her speech with this call-to-action about civic engagement. "We have a long way to go," Clinton told the crowd. "There are many fights to fight, and more seem to arise every day. It will take work to keep up the pressure, to stay vigilant, to neither close our eyes nor numb our hearts or throw up our hands and say, 'someone else take over from here.' Because at this moment in our history, our country depends on every citizen believing in the power of their actions, even when that power is invisible and their efforts feel like an uphill battle." Civic engagement. Voting in every election. Believing in your power. Now THAT is how you troll Trump.